To do: Check in which games the Pikmin do and do not revert to the leaf stage. The Swooping Snitchbug (サライムシ?, lit. : "Kidnapping Bug") is a creature found in the main three Pikmin games and Hey! Pikmin. They are legless, round, flying insects that have evolved wing-like antennae as a means of locomotion. In Pikmin and Pikmin 2, they have glass-like eyes with pupils, but in Pikmin 3, they have more realistic compound eyes. In Hey! Pikmin, they return to having less realistic eyes, although they are still red like in Pikmin 3. They swoop down, as their name suggests, and grab their prey with their claws – a maximum of two at once. After carrying them for a few seconds, they violently throw them towards the ground. This action would harm most prey, whereas Pikmin are simply replanted and reverted to their original leaf stage. They are also able to pick up the leaders in Pikmin 3, much like Bumbling Snitchbugs do in Pikmin 2 – if they don't escape, they will be tossed to the ground and damaged. These creatures will plummet to the ground if weighed down by a sufficient number of Pikmin, or with a single Purple Pikmin in Pikmin 2 or a single Rock Pikmin in Pikmin 3. This renders it susceptible to further attack. ultra-bitter sprays may also be used to freeze it in mid-air, causing it to drop to the ground, which is arguably easier, but of course produces no corpse, and may be considered a waste of sprays. Should the enemy throw a Yellow Pikmin that is holding a bomb-rock in Pikmin, the bomb-rock will explode, killing the Yellow Pikmin, all Pikmin caught in the blast, and likely itself, too. In Pikmin 3, it will carry the bomb rock and not the Pikmin, and throwing the bomb-rock merely activates it instead of causing an immediate explosion. Although the creature is not as interested in killing Pikmin as much as it is chucking them, it may end up throwing a Pikmin at a hazard. In Pikmin, it can and will grab Pikmin from the leader's hand, if the captain is holding on to it before throwing, but in Pikmin 2, it will ignore any held Pikmin; it can still steal it from the hand if it begun swooping prior to the grab, however. In Pikmin 3, every time it dives, it randomly chooses to catch Pikmin or leaders, and if it chooses the former, it will never succeed in grabbing a held Pikmin. If it snatches two Pikmin in a single dive, the way it throws them will also differ between games – in Pikmin, it will throw one Pikmin first, fly around some more, and then throw the second one, but in Pikmin 2 and Pikmin 3, it will throw both of them at once. In Hey! Pikmin, they will attempt to swoop straight down, grab Pikmin, and fly back up withought coming back again, counting as a death to the player's Pikmin. They are incredibly rare in this game, as only a few appear, in Olimar's Madcap Ride. In Pikmin, it only appears in The Forest of Hope on day 15 and forward, and in The Distant Spring on day 5 and forward. Particularly: Find out its health value by looking into the game files. ↑ In the Garden of Hope Remix, its HP is 500. “A Swooping Snitchbug attacks by snatching its enemies and throwing them to the ground. when a Swooping Snitchbug does this to a Pikmin, the force is enough to bury its victim – this essentially causes the Pikmin to revert to a sprout. These creatures can easily be brought to the ground by weighing it down with five or so Pikmin. Yellows are the best option to weigh it down, because their high reach makes it easier to hit it. Afterwards, a simple swarm can defeat it. If the Snitchbug captures a Yellow holding a bomb, it will explode while it is in the air. The same strategy from Pikmin can be applied here. Alternatively, throwing a single Purple Pikmin onto it will weigh it down right away. Be warned, as on sublevels with abysses, the snitchbug can throw Pikmin down the pit. The snitchbug is much less of a threat in this game. It is advised to not use Purples on metallic sublevels, as there are often bombs on those sublevels. In Pikmin 3, like in all of the other games, around 5 Pikmin are able to weigh the Swooping Snitchbug down, making it easy to defeat. It's recommended to use Yellow Pikmin to weigh it down, as their throwing height ensures it will land on the Swooping Snitchbug, and the Snitchbug can fly higher in this game. If you have a reasonable amount of Winged Pikmin, swarming it will be sure to weigh it down. A direct hit from a Rock Pikmin will bring the Swooping Snitchbug down too, similar to how throwing one Purple Pikmin on it will weigh it down in Pikmin 2. To do: Add to the glitches article. There is a rare glitch in Pikmin: once you've knocked the Swooping Snitchbug down to the ground, throw your Pikmin onto the creature and swarm it with all of the other Pikmin, which should kill it. Then, carry it back to the Onions by swarming the corpse. Later, you will notice the Pikmin you threw on the squirming Swooping Snitchbug are floating in the air, making the attacking motion as if they are attacking something invisible. The creature appears as a trophy in Super Smash Bros. Brawl and Super Smash Bros. for Wii U. “A member of the scarpanid family. Although originally a ground dweller, its oversized antennae developed into wings, allowing it to fly around freely. the snitchbug doesn't eat Pikmin, but rather picks them up, carries them away, and firmly replants them in another location. “A strange flying insectoid creature from the Pikmin series. Much like a fly rubbing its legs together, the Swooping Snitchbug has a habit of rubbing its hands. When it swoops down and snatches Pikmin from the ground, it doesn't eat them. Instead, it discards them after a few seconds. Why? Who knows?! Who cares?! They're free! “A strange flying insectoid creature from the Pikmin series. Much like a fly rubbing its legs together, the Swooping Snitchbug has a habit of rubbing its hands. When it swoops down and snatches Pikmin from the ground, it doesn't eat them. Instead, it just throws them back to the ground after a few seconds. Why? Who knows?! In its English name, "Swooping" refers to how it swoops down to catch prey. Its Japanese name is サライムシ?, which translates to "Kidnapping Bug". The scientific name of this creature is Scarpanica kesperens, which is made up of two unknown words. Internally, it is known as napkid in Pikmin, which is likely a misspelling of "kidnap", which in turn is part of the translation of its Japanese name. In Pikmin 2 and Pikmin 3, it is called sarai instead, the first word of its Japanese name. On the enemy reel of Pikmin, the Swooping Snitchbug's clip plays between the Fiery Blowhog and the Goolix's clips. The enemy reel is otherwise sorted alphabetically, and because of this, and due to a lot of the clips hinting to the fact that the enemy reel was made a bit early during development, it is possible that before the game's release, the Swooping Snitchbug had a name that started with "Flying". 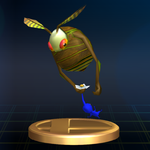 Portuguese (NoE) Snitchbug Predador Predator Snitchbug Name taken from the Super Smash Bros. for Wii U trophy. Add an image of the creature in the creature log and of it dead in Hey! Pikmin. Artwork of a Swooping Snitchbug carrying Pikmin from Pikmin. A Swooping Snitchbug in Pikmin. A Swooping Snitchbug's corpse in Pikmin. A Swooping Snitchbug breaking out from being petrified, in the Perplexing Pool. 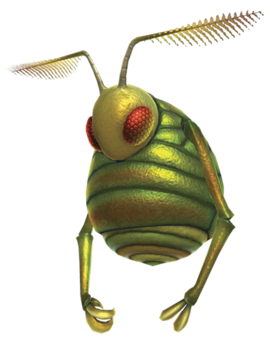 A Swooping Snitchbug in the Piklopedia of Pikmin 2. A Swooping Snitchbug in the enemy reel. A Swooping Snitchbug being attacked by some Winged Pikmin in Pikmin 3. A Swooping Snitchbug being attacked from behind by Yellow Pikmin in Mission Mode (Battle enemies!). A close-up of a dead Swooping Snitchbug. A Swooping Snitchbug in Pikmin 3 holding Charlie. A Swooping Snitchbug throwing Alph. The creature's e-card, #35 (9th blue card). The data file on the Swooping Snitchbug. A Swooping Snitchbug rubbing its hands after tossing Captain Charlie into the ground. Note that there's another Swooping Snitchbug. Two Swooping Snitchbugs swooping downward in Hey! Pikmin. A Swooping Snitchbug in the cutscene in Olimar's Madcap Ride. When idle, the Swooping Snitching rubs its hands together, similar to a fly. This can also be seen with the Bumbling Snitchbug. Swooping Snitchbugs and Mamutas are the only ways one can see a burrowed Bulbmin. In Pikmin and Pikmin 2, when Pikmin are grabbed, their squeal is the same as if they got bitten, but it is a different sound in Pikmin 3. In Pikmin 3, if a Pikmin lays down a bomb rock, there is a chance the Swooping Snitchbug will grab the bomb rock. It will then explode in its hands, killing it. The position of the Swooping Snitchbug in the enemy reel, which is otherwise alphabetized, indicates that the creature's name may originally have started with the word "flying". This page was last edited on March 3, 2019, at 09:35.